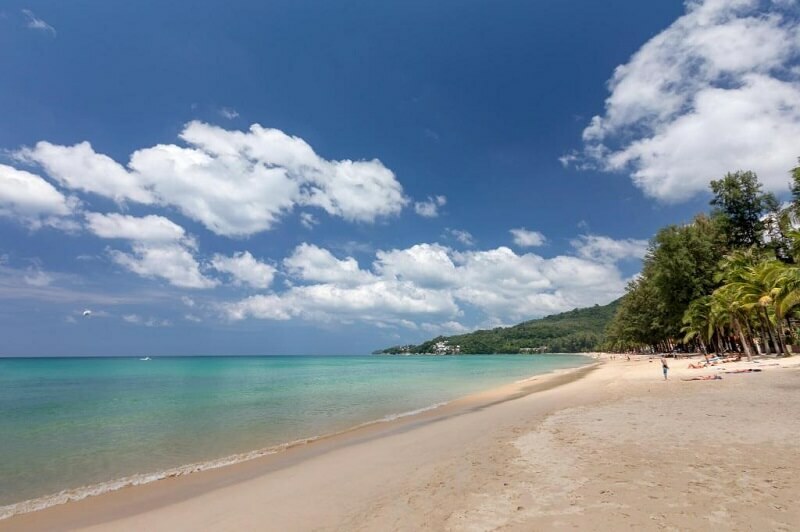 Kamala Beach is one of the most beautiful beaches in Phuket and is a haven for travellers who prefer the quieter life. Over the years Kamala has fast become one of Phuket's best family vacation hotspots with many new hotels and resorts offering top notch accommodation and excellent facilities. Kamala's location is perfect, only 6km north of the busy and action packed Patong and just south of Laem Singh beach on the west coast of Phuket. The area around Kamala is relatively secluded and the 2km beach provides a great spot if you are looking to get away from it all. Kamala was originally a small fishing village, with the local population being mainly Muslim. Over the years Kamala has also become a popular destination for retirees and long term visitors that stay in the small hotels, villas and apartment rentals around the area. The fishing village atmosphere remains, and its not unusual to see local fishermen casting their nets. The northern end of the bay is heaven, here you will find an unspoiled white sandy beach with a very laid back and relaxed atmosphere. The middle section off Kamala is pretty much dominated by the local village, including resorts, small bars and seafood restaurants. While the southern end of the beach can get fairly busy during the high season, it has a totally different feel compared to Patong or Karon, and is generally much more relaxed. From November to April the water around Kamala Beach are calm and clear and you won't find any waves. The best places to go swimming at Kamala is between the northern end and the middle of the beach. Towards the rocks at the northern end of the beach is the best spot for snorkelling, you can rent snorkelling equipment from vendors along the beach. Sunbeds can be hired for around 100 baht, most of them are located in the middle of the beach and towards the southern end. There's not many activities on the beach, except for jet skis or para sailing that you will find during the high season. You can also rent a longtail boat to explore some of the nearby beaches such as Laem Singh or Surin beaches or just relax and enjoy a massage. For those who enjoy surfing from May to October the far northern end of Kamala Beach has a reef break, which attracts many surfers. There are several PADI dive shops offering all levels of qualification from beginners to advanced for experienced divers. 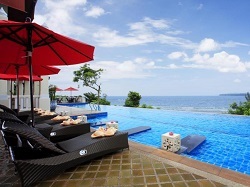 There is a good mix of guesthouses, bungalows, villas and family friendly resorts located around Kamala Beach. We have listed our favourite places to stay below. 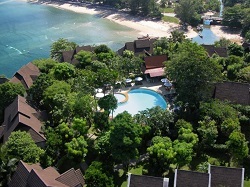 Kamala Beach Resort is located directly on the beach, with four swimming pools. 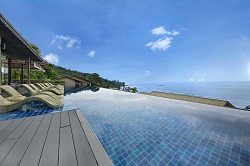 Hyatt Regency Resort is located on a hillside just south of Kamala Beach. This 5-star resort offers stunning views, a large infinity pool, pool bar, spa treatments a fitness centre and so much more. This resort is well suited for family vacations. Check rates and reviews on Agoda. 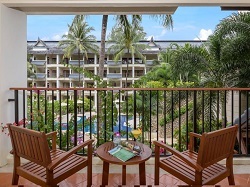 The Novotel is located at the northern end of Kamala beach, this family friendly resort is perfect for the whole family. This resort offers direct beach access and has a great selection of guest rooms, ocean suites and villas, including one and two bedroom pool villas. Cape Sienna is located on a hillside capturing stunning ocean views from every room. 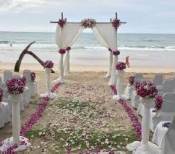 This resort is ideal if you are searching for a relaxing and romantic place to stay. 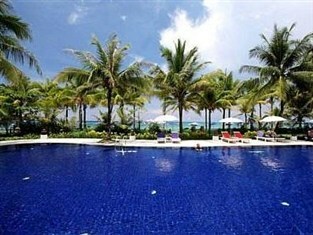 This resort is best suited for couples, it is not recommend for families travelling with young children. 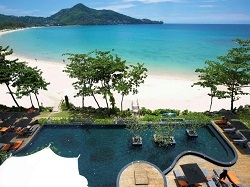 The resort offers a free shuttle bus to both Kamala and Patong beaches. Read more on Agoda. 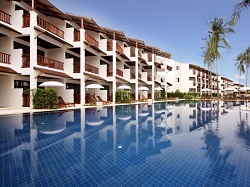 Sunwing Resort at Kamala has everything you need for a fun family vacation in Phuket, including a selection of swimming pools, a kids club and much. Read more about the Sunwing resort on Agoda. Ayara Kamala Resort is perfect for that romantic getaway, this resort is built on the hillside at the southern end of Kamala Bay with breathtaking views. There is a selection of private pool villas or a deluxe room with Jacuzzi. Read more on Agoda. The Swissotel Resort is an ideal destination for families, with breathtaking views and great amenities. Mum and Dad can relax around the pool, while the kids are entertained at the kids club. Read more on Agoda. 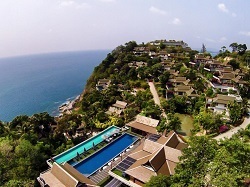 The Aquamarine Resort & Villa has a mix of luxury Thai Style rooms and ocean villas, every room and villa has stunning views across Kamala Beach. The resort is situated high in the hills about 10 minutes from the beach, however the resort provides shuttle services to Patong & Kamala. Read reviews and check rates on Agoda. Kamala Estate Hotel is the perfect location for people in search of relaxation, privacy and security. The southern end of the beach has many beachfront restaurants and bars that serve seafood, Thai and International dishes. If you're on a budget there are hawker stalls that set up throughout the area, with good food at cheap prices. One of the best restaurants that we found was the Rockfish Restaurant, set on the beach with stunning ocean and mountain views. The Rockfish Restaurant is located next to the Kamala Beach Estate. Just down the road at Cape Sienna Hotel and Villas, is Plum Fine Dining and the Vanilla Sky Bar and lounge both with great food, a fantastic atmosphere and one of the best ocean views in Phuket. Throughout the day at the northern end of the beach you will see hawker stalls that sell all kinds of Thai food, like chicken satay, Phad Thai or Thai curries. On the beachfront across the road from the Kamala school there is casual beachside eateries. Until recently the nightlife at Kamala was rather laidback with a few reggae bars and restaurants, however with the opening of Café Del Mar Beach Club and HQ Phuket Beach lounge the nightlife around Kamala has certainly ramped up. Along the beach road is one of our favorite places called "Bob's Bar", the owner is a very friendly man who can tell you lots of information about Phuket or any other destination in Thailand. The bar is located next to Papa Crabs Guesthouse, a great place to listen to reggae music and is open from 2.00 pm to 2.00 am. Another bar we found that was close to the beach and had a friendly atmosphere is the "Long Ma Do Bar". There are also a few bars and restaurants along Kamala Beach Road, the Paradise Bar that is near the 7-Eleven is good as it had a pool table, which kept the kids happy. For cheap drinks you must visit the Kamala Beer Garden between 4.00 pm and 8.00 pm and listen to the live music in the open air bar. If you are after more adventurous and fun nightlife in Phuket, I would head to Patong and Bangla Road. Kamala is home to one of Phuket's biggest "Tourist Attractions", the extremely popular Phuket Fantasea, an attraction that shouldn't be missed when holidaying in Phuket. Fantasea is the ultimate cultural theme park, showcasing the charm and beauty of Thailand, that also enriches ancient Thai traditions. The Kamala Temple, known as Wat Baan Kamala is located at the southern end of the beach. The temple and its grounds have been restored since the Boxing Day tsunami and the locals and resident monks welcome visitors. A visit to this Wat can be an enlightening and cultural experience. Kamala was the worst area in Phuket hit by the tsunami on December 26, 2004. A tsunami monument has been built in the park towards the middle of the beach. Shop like the locals do at the village markets, try some of the local food and experience the Thai way of life. 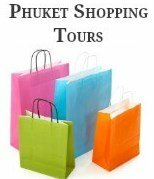 These markets are like most local markets in Phuket, they sell everything including food, cut flowers, sunglasses, clothes, footwear, bags and belts. As this is where the locals shop, most prices are fixed and you pay what the locals pay. A pair of sunglasses cost 100 baht and a T shirt was 150 baht. The village market is located on the Main Road opposite the Kamala Bakery every Wednesday and Saturday from 3.00pm to 7.30pm. The Kamala Friday market is popular and runs all year. A similar set up to the village market but on a bigger scale. Here you can buy fresh fruit and vegetables and other local produce as well as DVD's, CD's, handicrafts, sunglasses and clothing. You will find these markets located opposite Phuket Fantasea every Friday from around 2.00pm to 7.30. More shops can be found at Kamala Beach Plaza, located on the beach road. The shops here mainly sell souvenirs, sarongs, clothes glasses, bags and swimwear. Throughout the high season beach vendors set up around the beachfront selling souvenirs and beachwear. Along the southern part of the beach we found a 7-Eleven, massage shops, diving shops and bars. Drive along the coast road from Patong, this will take you up a big hill from here you can see a panoramic view of Kamala, when you reach the bottom of the hill turn to the left.